There will be two open-call poster sessions, with the opportunity for up to 70 people to present their research on November 14th or 15th. To create dynamic and engaging poster presentations we are collaborating with ePosterBoards LLC to create all-electronic poster sessions! The e-poster platform allows the presenter to include videos in addition to photos, as well as having the flexibility of having more than one slide to share their reintroduction stories. 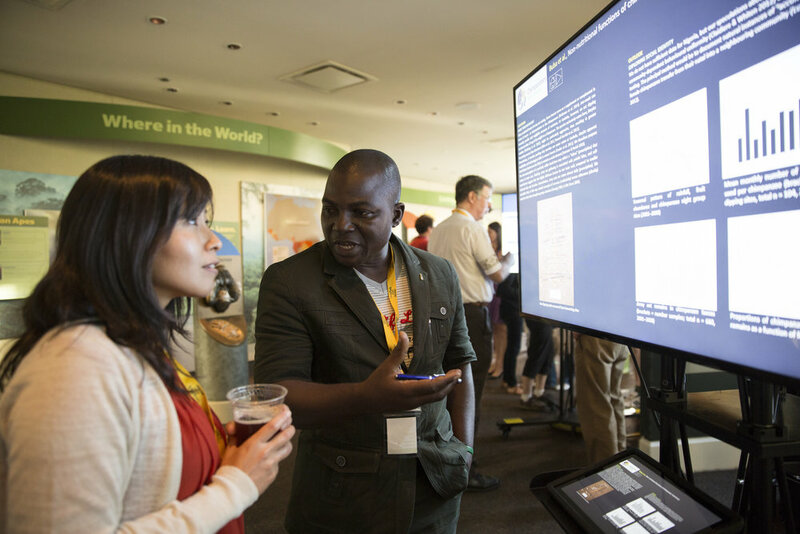 To better explain all of the possibilities available with eposters, we have included a video from a poster presented in 2016 at the Chimpanzees in Context conference also hosted at Lincoln Park Zoo. In the attached poster you can see the incorporation of videos from ape training sessions, as well as brief descriptions of the current cognitive studies occurring at Lincoln Park Zoo. All e-posters must be submitted by Friday, November 9 in order to be uploaded. Please choose the template you’d like to use, and feel free to make any edits to the look of the slides. We only ask you do not change any of the dimensions. Please do not hesitate to email reintroductionconference@lpzoo.org with any questions you might have while you prepare your posters. Please visit the ePosterBoards LLC website for more information. If you have any queries or questions, please email conference organizers.